October 2017 - Previous Photograph Competitions - Military Airshows. 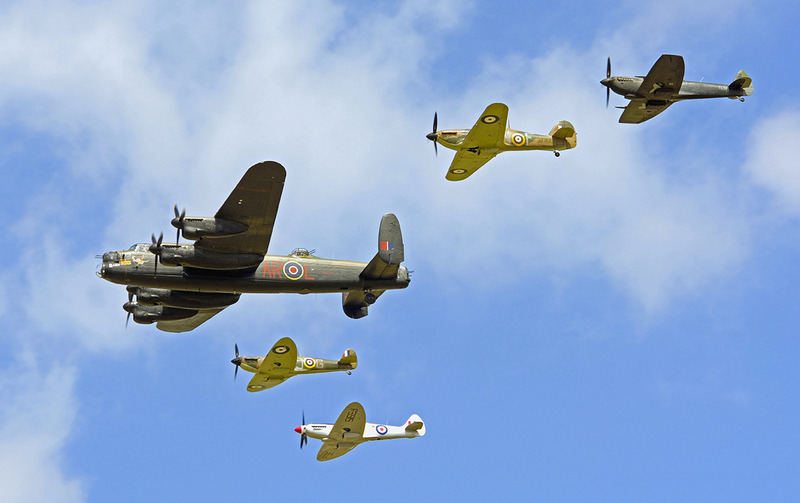 BBMF formation at this years RIAT at Fairford. Taken on a Nikon D7000 with Sigma 18-200mm lens. BBMF Lancaster departing from RIAT 2010, edited in sepia, just for the WW2 look! Canon EOS350D. Peter Busby BBMF Dakota taken during a "flyover" display at Lymington in Hampshire during June 2014, to commemorate the WW2 airfields of the New Forest. Sony Alpha 300 coupled with a Sigma 70-300 mm telephoto lens. Paul Wallis BBMF Lancaster and Hurricane making their first display flight following the Merlin engine grounding issue. Shot at RAF Scampton on Saturday 9th September on the first day of the Scampton Air Show. Nikon D5 and Tamron G1 150-600 lens. Avro Lancaster PA474 and VS Spitfire PR.XIX, PS915, in glorious evening light at Southport Airshow, Friday 15th September 2017.